What Are The Best Acupressure Mats? What The Heck Is An Acupressure Mat? An acupressure mat is a literal "bed of nails" for you to lay on. Well, sort of. An acupressure mat is a mat that lays on the floor like a yoga mat, and you lay on top of it with various parts of your body facing down. Except there is one difference between this mat and a yoga mat: this one has plastic spikes sticking up all over it. A closer view of an acupressure mat. If this sounds weird, that's because it is! Why would anyone want to lay on a bed of plastic needles that poke and prod your body? Well, there's actually a reason for it. And it's a pretty good one. Acupressure is an energetic healing technique that relies on putting pressure on precise acupressure points around the body. These acupressure points are based on the acupuncture meridian system of the body. They're generally the same points that professional acupuncturists put needles into in order to stimulate your meridian energy. You can use needles such as in acupuncture treatments to balance your meridian energy, or you can use fingers in acupressure treatments to do it. In fact, any kind of pressure at the right point will help stimulate your energy flow. Acupressure mats take this to a whole new level. Instead of targeting one acupressure point at a time with a single metal needle or a finger, they target many acupressure points all at once by using plastic spikes. If this sounds painful, that's because it kind of is! But the pain is rewarded by its effectiveness at relieving your body's health symptoms. Just like acupuncture treatments poke and prod you with metal needles to bring about bodily healing, an acupressure mat treatment pokes and prods you with many plastic pointy edges in order to bring about the same kind of healing. Acupressure Mat Buying Guide: What's Important? I'm going to be very honest here: most acupressure mats are relatively the same in design and function. That's because an acupressure mat is a simple device. 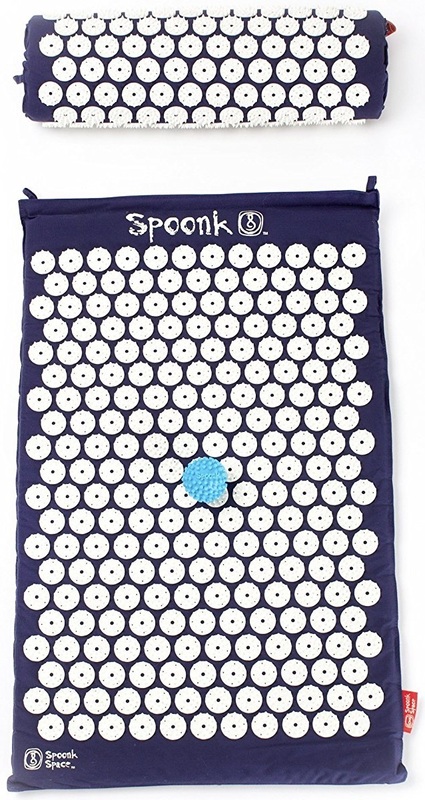 It's basically just a yoga mat with a bunch of hard plastic spikes sticking out of it all over the place that are designed to stimulate your muscles and acupressure points with focused pressure. The biggest things to look out for when buying an acupressure mat are simply the extras that come with it. Some of them come with an acupressure pillow, which is a pillow-like device for resting your head and neck on while using the acupressure mat on the rest of your body. One of our reviewed acupressure mat sets also comes with a strap that you can wrap around a part of your body such as your lower back, to target that area specifically. Some acupressure mats also come with a carrying case, which is only really necessary if you plan on taking your acupressure mat and pillow to the park to do acupressure massage in the sun. You may also want to take it to the gym and use it to relax your muscles after a hard workout. There's also the issue of price. Some acupressure mats cost a bit more or less. While a higher price may indicate higher quality material, the reality is that both cheap and expensive acupressure mats tend to get the same quality of customers reviews. Most customers rave about how acupressure mats help relieve their muscle pain, or help them get a better night's sleep, or help relieve many other health issue. However, there are always a few customers who don't find relief. Perhaps this is because some people simply need more than just an acupressure massage to fix their serious health problems. Most of the acupressure mats you'll see below will all "get the job done", so to speak. However, let's take a close look at each one and find the best fit for you. This is the best-selling acupressure mat on Amazon, and for good reason. Nayoya is a health product company that produces many high quality health and wellness devices that you can find being sold all over Amazon. Their acupressure mat is the the most reviewed one on the entire site, and very highly rated by customers who laud its benefits. Most popular acupressure mat on Amazon - used and enjoyed by thousands of customers. High satisfaction rating by customers. 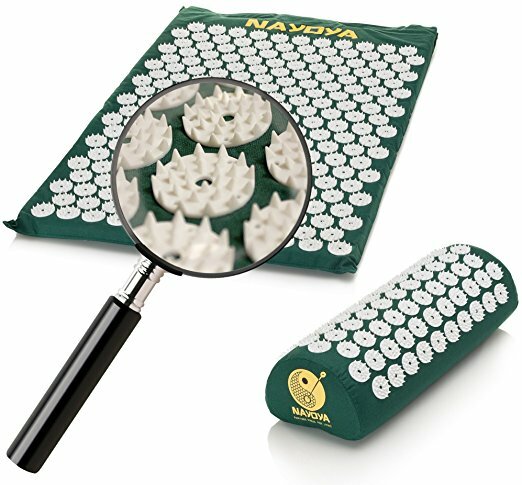 This is the most highly rated acupressure mat available on Amazon. Thousands of customers have bought and enjoyed this acupressure mat set of products. This product is premium priced but comes with an acupressure roller ball that other acupressure mat sets don't come with. Comes with acupressure roller ball. 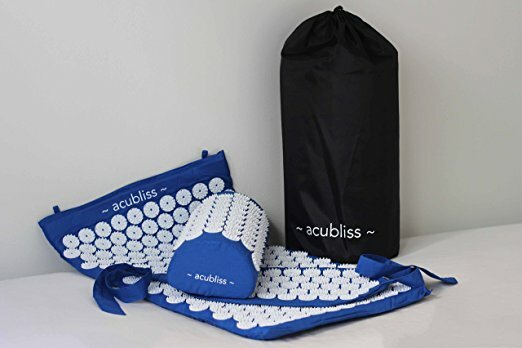 This is the best value for your money, because it's one of the cheapest acupressure mat sets available anywhere online. I'm surprised that they also include the acupressure pillow for such a low cost. This set is also the only set I could find that comes with several color options to choose from. Several color options to choose from. This acupressure mat set comes with the normal pillow and carrying case like other sets. However, it is unique in that it comes with a pad that has a strap attached to it. This allows you to tie the acupressure pad around your lower back or other body parts in order to target it specifically. For example, you could wrap the pad around your lower back to treat back pain while sitting at a computer chair. Comes with acupressure pad with straps.